For most, going gluten free is an adjustment. Gone are wheat, rye and barley; in their place come rice, quinoa and millet. Gluten-free grains and products made with them can ease the transition to eating gluten free. But what happens when even gluten-free grains cause continued symptoms? Should those with celiac be not only gluten free but grain free as well? While the grain-free Paleo diet is still trendy, research shows that ancient man most likely ate grains—in particular, oats, millet and sorghum. Today, grains such as corn, rice and wheat make up a little more than half of the calories consumed around the world. Grains can be whole, refined or enriched. Whole grains—rich in fiber, B vitamins, iron, antioxidants, healthy fats and some protein—contain three distinct parts: the bran, germ and endosperm. Examples of gluten-free whole grains include brown rice, oats and quinoa. Refined grains, which became available with the advancement of milling techniques in the late 1800s, are stripped of their healthy germ and bran. While refining a grain improves the texture and shelf life, it also removes B vitamins, fiber and iron. Enrichment of grains, which began in the 1940s, returned many vitamins and minerals to refined grains, most notably folic acid, an important nutrient for women of childbearing age. Whole grains have been shown to yield many health benefits, including a reduction in the incidence of type 2 diabetes, high cholesterol, cardiovascular disease and inflammation. A recent randomized controlled trial found that those who consumed whole grains in place of refined grains experienced more significant weight loss and reduction of inflammatory markers in the body. But some with celiac continue to experience symptoms despite their best efforts to eat gluten free. Could grains themselves be to blame? Jessica Beacom, RDN, and Stacie Hassing, RDN, LD, registered dietitians with The Real Food Dietitians (therealfoodrds.com), share similar stories: “In our experience, patients with celiac disease that aren’t responding to the gluten-free diet tend to do well and make greater progress when all grains are removed from the diet.” Beacom and Hassing cite concerns about contamination of naturally glutenfree grains as one reason to consider removing them from the diet. 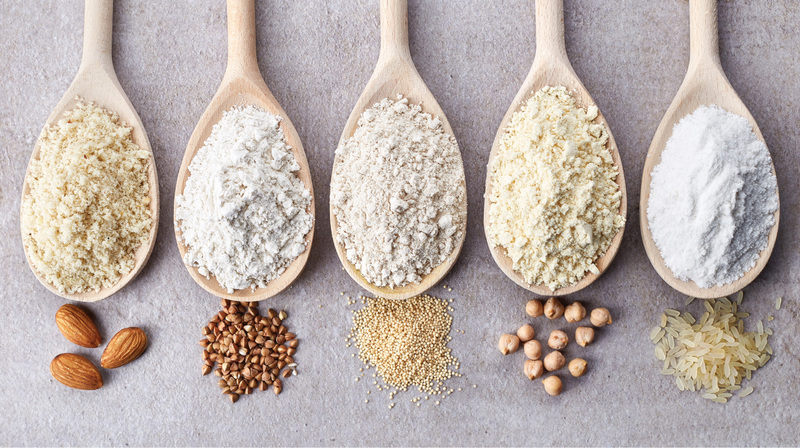 “Sometimes gluten-free grains can be cross-contaminated with gluten, as is the case frequently with oats and millet that aren’t produced or prepared in a dedicated facility and tested appropriately,” says Hassing. Concerns about the purity of naturally gluten-free grains are not new. In 2009, dietitian and gluten-free expert Tricia Thompson (glutenfreewatchdog.com) tested flours that were not specifically labeled gluten free but made with naturally gluten-free grains, such as millet, soy and sorghum. She found significant levels of contamination in some of the samples, indicating that some of the naturally gluten-free grains were at risk for contamination with gluten, either in the fields, transport or manufacturing. (It is important to note that flours specifically labeled gluten free were not found to be contaminated with gluten.) Based on this research, Thompson and other experts recommend eating naturally gluten-free grains and products made with them only if they are explicitly labeled gluten free. Constipation is a common complaint for many who go gluten free; omitting grains entirely can potentially slow things even further. “Fiber is firmly associated with whole grain in many people’s minds. When people think about a grain-free diet, it seems impossible to get a sufficient amount of fiber,” says Hassing. 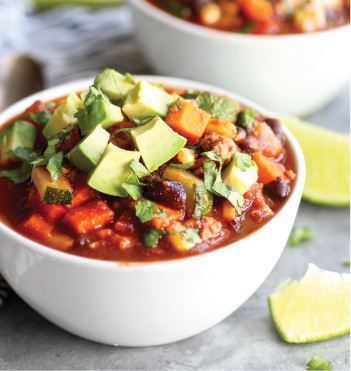 “But vegetables, fruits, nuts and legumes have higher fiber content, in many cases, than whole grains.” See “Fiber up the grain-free diet,” above, for Beacom and Hassing’s tips to increase fiber intake without grains. Stewart also recommends her patients look for other sources of dietary fiber, but if that doesn’t do the trick, she also may suggest a supplement. “I have found that when it comes to supplements, there is no one-size-fits-all solution, so I may recommend supplements made from psyllium husk fiber, acacia fiber, inulin or guar gum.” Stewart advises caution, however, when choosing to take fiber in supplement form, as too much too soon can cause increased digestive discomfort. In a large pot or soup kettle over medium heat, add the oil. Once the oil is hot, add ground meat, garlic, onion, bell pepper, zucchini and carrot. Saute for 7 to 9 minutes, or until meat is cooked and no longer pink. Add seasonings, tomato sauce, water, tomatoes, beans and corn. Bring to a boil over medium-high heat. Reduce heat to low, cover and simmer for 15 minutes, or until carrots are tender. Serve with toppings of choice and salt to taste, if desired. Wrapped in a crisp lettuce leaf, this recipe makes for an easy lunch that’s tasty and fresh. *To toast almonds, place in a small pan over medium heat. Toast until slightly browned, tossing occasionally. This only takes a few minutes, so watch closely. 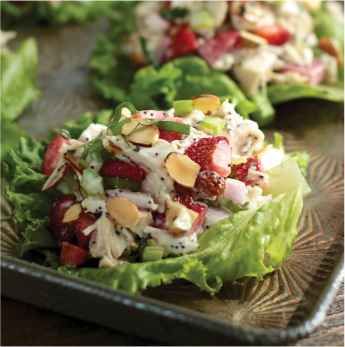 In a medium bowl, combine the chicken, strawberries, red onion, celery, almonds and basil. In a small bowl, combine the mayonnaise, lemon juice and poppy seeds. Gently stir into the chicken mixture. Salt and pepper to taste. Serving option: Scoop into a lettuce leaf or onto a bed of greens and top with green onions and a few toasted almonds. 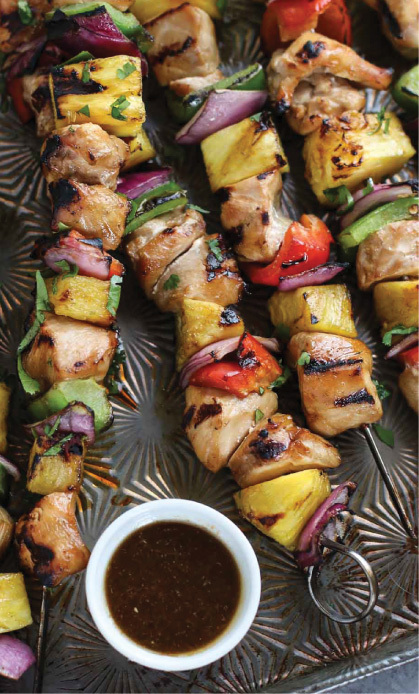 Nothing says “summertime” like these grilled chicken and vegetable kebabs with sweet and savory teriyaki sauce. In a small bowl, whisk to combine all marinade ingredients. Add chicken pieces, toss and coat. Cover and refrigerate while you prep the vegetables and pineapple and the grill preheats. Thread meat, pineapple, peppers and onions onto skewers, alternating as you go. Brush leftover marinade over the kebabs. Grill over medium-high direct heat, turning every 5 minutes or so, until the chicken is cooked through and the vegetables are tender. Remove from grill and serve. A fresh, grain-free take on a traditional Middle Eastern dish. We’ve replaced the bulgur wheat with lightly sauteed cauliflower “rice” for a gluten-free and Paleo-friendly side dish to serve with your favorite protein or share at your next potluck event. Place a large skillet over medium heat. Add 1 teaspoon avocado or olive oil. When oil starts to shimmer, add the riced cauliflower and stir. Continue heating and stirring until cauliflower starts to release some of its moisture and is crisp tender (don't overcook it—you want it a little al dente, or toothy). Remove from heat and continue to stir for a couple more minutes to help the moisture evaporate as the cauliflower cools. Spread onto a large plate or baking sheet and set in the freezer while you make the dressing and chop the veggies. When cauliflower is cool, place in a large bowl with cucumber, celery, tomatoes, onions, mint and parsley.